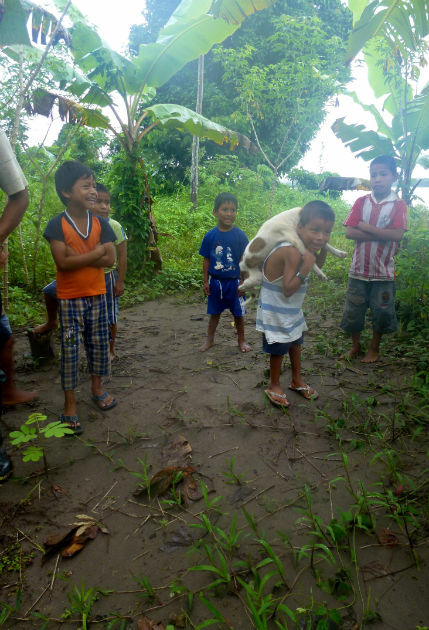 There are several villages in the area we visited, where the local riberenos of the Pacama tribe live on the banks of the Amazon river. The guides try to schedule visits to different villages for their various tour groups. 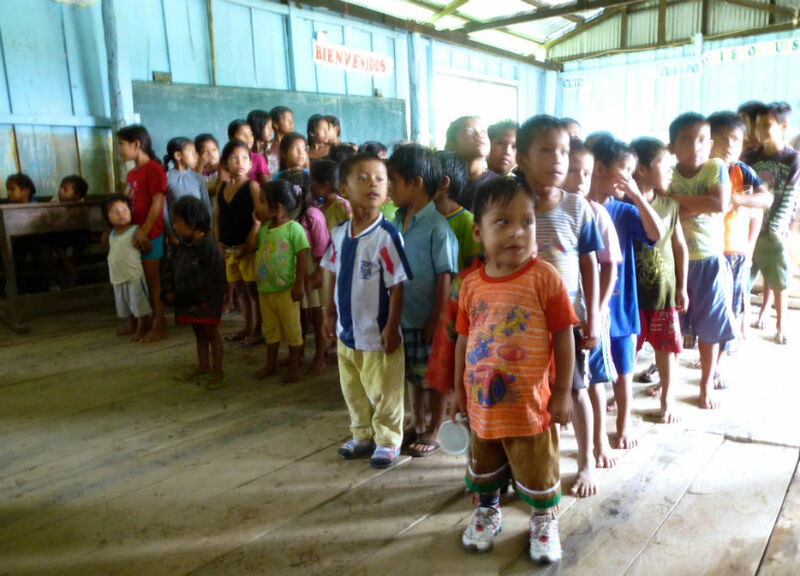 We visited the Pacama Village on the Nahuapa River. La Turmalina cruised slowly along, quite close to the river banks till we reached the village to which our visit had been arranged. Unfortunately it was pouring with rain. The ground was very muddy and despite my long but unwieldy poncho I got very wet. As it was also hot, it was a bit like being inside a steam room. Hot and steamy and soaking. The huts were all built up on stilts to prevent flooding when the river is high. We were told that over the course of a year the level of the river may differ as much as 40 feet. At the time we were visiting, the river was rising and was about midway to its highest point. As we cruised along we could often make out the high water marks on the trunks of the trees lining the river banks. The villagers had made special preparations for our visit. 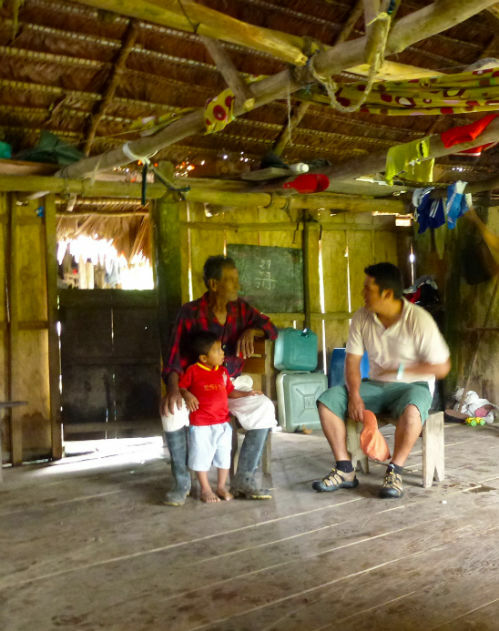 We paid a visit to the aged chief of the village where we listened via translation to some Amazonian tall tales. Typical stories included tales of beautiful women encountered on a solitary walk, who would vanish suddenly and in their place would be an iguana or a frog or some such mystical event. 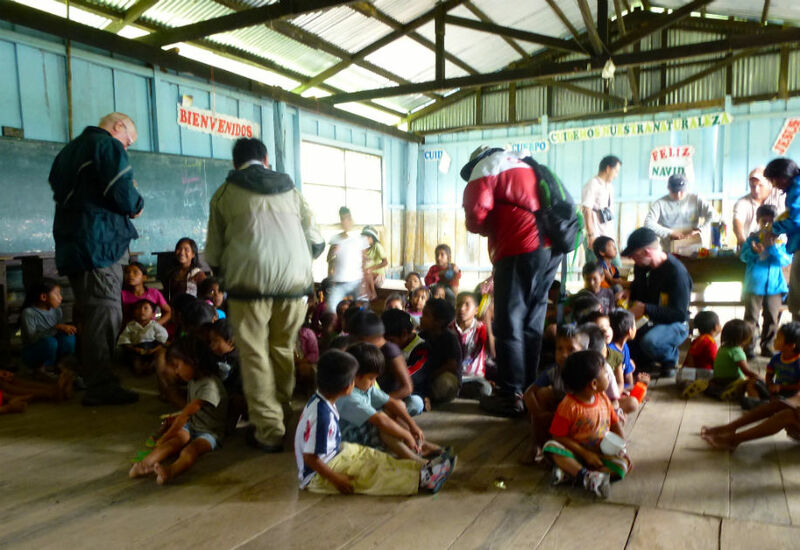 Then we walked across the field to the school building where there were about 100 or more children assembled. Robinson led the children in singing and playing games that introduced them and also introduced their visitors, and let them compete to answer questions and win some of the small prizes J-C and R-P had bought with the money we donated. There was also discussion about the work that is being done to preserve the indigenous languages and ensure that the children don't lose their cultural legacy while being educated to live in the modern world. 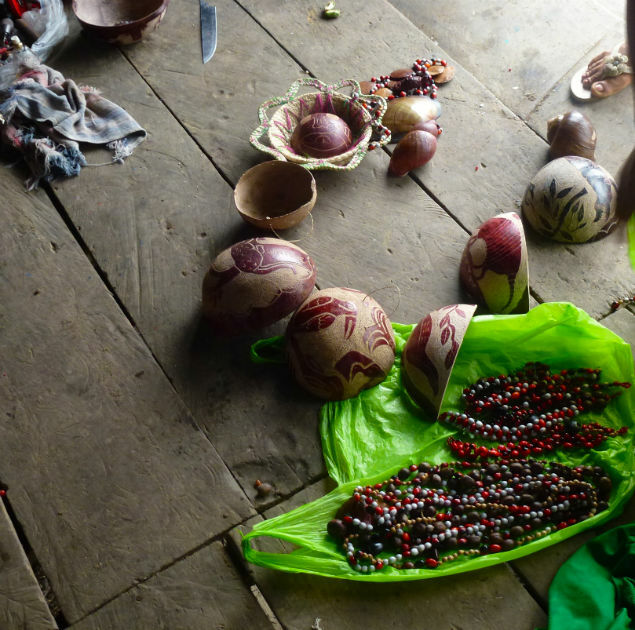 Following this event we had an opportunity to purchase some of the local crafts before returning to the ship. If you plan a trip to this area, or similar, it is always appreciated if you bring donations of materials such as pencils, notebooks and other school items. Interestingly the children were not just given items but had to earn them by answering questions or participating in some way. The objective is to prevent the kids developing a culture of dependency and instead encourage responsibility and effort.